Dr. Rabinder N. Madan, Ph.D., Life Fellow IEEE, is a Program Officer at the Office of Naval Research. He received his B.Sc. (Hons) and M.Sc. in Physics from the St. Stephen's College, Delhi and a Ph. D. in Theoretical Physics from Princeton University. In his current position as Program Officer at the Office of Naval Research, he directs and manages programs in Tracking, Networked Sensing, Signal Processing, Information Fusion and Surveillance. 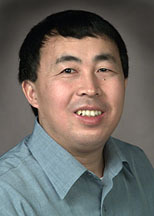 In the past he has held faculty positions at the Universities of California, Massachusetts and North Carolina and was a Senior Scientist at Hughes Aircraft Co. His interests and publications are in information sciences, signal processing, communications theory, nonlinear phenomenon, variation and optimization principles, scattering theory and principles of radar. He maintains an Ex-Officio membership in SPTM, interacts with the signal processing community through his participation and support for students at ICASSP and other signal processing related workshops and conferences. In 1989 he was awarded the IETE J. C. Bose Memorial Award for the best paper in Science and Engineering. He is a Life Fellow of the IEEE and a Fellow of the Institute of Mathematics and its Applications. He serves as the Editor-in -Chief of the Journal of the Franklin Institute. Dr. Xuemin (Sherman) Shen, Ph.D., Fellow IEEE, Fellow of the Engineering Institute of Canda, received the B.Sc. (1982) degree from Dalian Maritime University (China) and the M.Sc. (1987) and Ph.D. degrees (1990) from Rutgers University, New Jersey (USA), all in electrical engineering. He is a Professor and University Research Chair, Department of Electrical and Computer Engineering, University of Waterloo, Canada. Dr. Shen's research focuses on resource management in interconnected wireless/wired networks, UWB wireless communications networks, wireless network security, wireless body area networks and vehicular ad hoc and sensor networks. He is a co-author of three books, and has published more than 400 papers and book chapters in wireless communications and networks, control and filtering. Dr. Shen served as the Technical Program Committee Chair for IEEE VTC'10, the Symposia Chair for IEEE ICC'10, the Tutorial Chair for IEEE ICC'08, the Technical Program Committee Chair for IEEE Globecom'07, the General Co-Chair for Chinacom'07 and QShine'06, the Founding Chair for IEEE Communications Society Technical Committee on P2P Communications and Networking. He also served as a Founding Area Editor for IEEE TRANSACTIONS ON WIRELESS COMMUNICATIONS; Editor-in-Chief for Peer-to-Peer Networking and Application; Associate Editor for IEEE TRANSACTIONSON VEHICULAR TECHNOLOGY; Computer Networks; and ACM/Wireless Networks, etc., and the Guest Editor for IEEE JOURNAL ON SELECTED AREAS IN COMMUNICATIONS, IEEE Wireless Communications, IEEE Communications Magazine, and ACM Mobile Networks and Applications, etc. Dr. Shen received the Excellent Graduate Supervision Award in 2006, and the Outstanding Performance Award in 2004 and 2008 from the University of Waterloo, the Premier's Research Excellence Award (PREA) in 2003 from the Province of Ontario, Canada, and the Distinguished Performance Award in 2002 and 2007 from the Faculty of Engineering, University of Waterloo. Dr. Shen is a registered Professional Engineer of Ontario, Canada, an IEEE Fellow, and a Distinguished Lecturer of IEEE Communications Society.